What do our integrators have to say about us? Are you thinking about integrating your project or application with Merchant Warrior? Are you wondering about how complex an integration with our advanced Payment Gateway may be? Here’s what Max Milbers, the Project Leader of the Virtuemart shopping cart had to say about his experience of integrating the Merchant Warrior Payment Gateway. He also mentions how the Merchant Warrior Token Payments product will be integrated in a future release of Virtuemart. “As I started to implement the MerchantWarrior payment plugin for virtuemart, I didn’t have any knowledge about the idea and security concept of MerchantWarrior. I expected a complex security concept and high requirements. Merchantwarrior gave me some easy to read pdfs describing the system. The idea behind the Token system is that a customer uses its credit card information only once and crucial information is not stored at the shop. But the customer is able to reuse the credit card without entering the data again. When a shopper uses its credit card the first time, Merchantwarrior creates a unique id (token), which only works for one shop. Normally when a shop gets hacked, all stored credit cards must be frozen, replaced and deleted. This is a big damage for the credit card institutes and the shopper. The security gain using Merchantwarrior is that the information stored at the shop, fits only to one shop in the world and has nothing to do with the normal credit card data. This is a very good security gain. We will definitely keep you updated with the future releases of the Virtuemart plugin for Merchant Warrior and the ability to take advantage of Token Payments. Go the Admin Panel of Virtuemart in the Joomla backend. Go to the topic store and click “Add Payment Method”. Give your payment method a name, ensuring that you enter the correct code (MW). 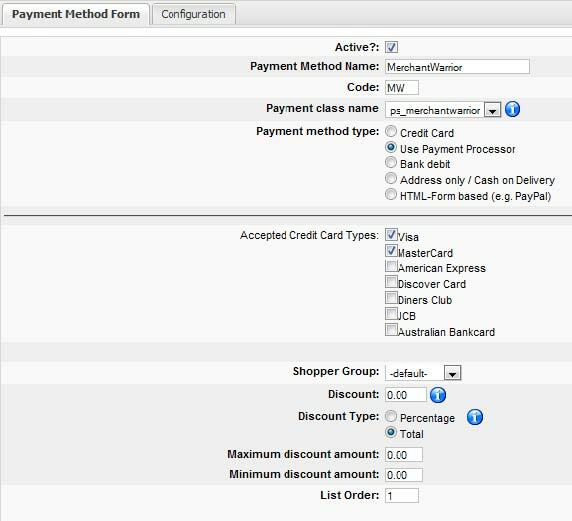 Choose a payment class name – “ps_merchantwarrior”. 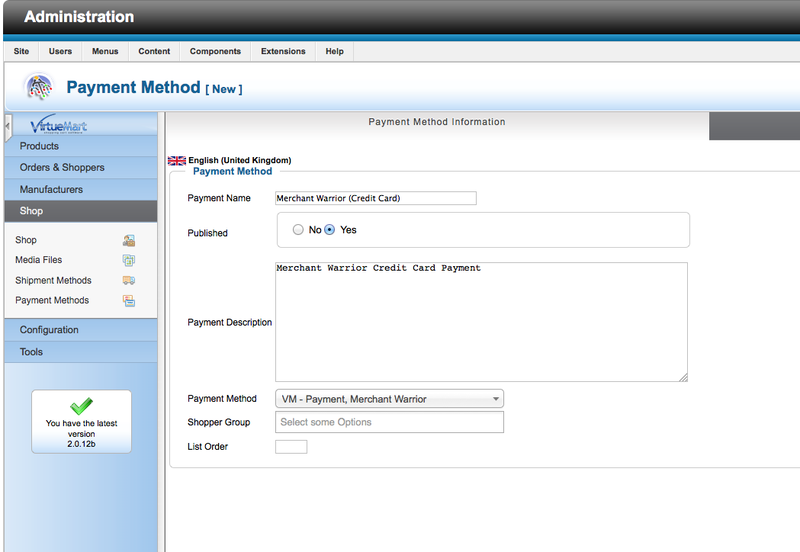 Set the Payment Method Type to “Use Payment Processor”. Enable the default Credit Cards. Go to the Configuration tab to set your Merchant ID and Merchant Password. If you have any issues during this process feel free to contact the Merchant Warrior Support Team.